Do you have children or grandchildren that just adore dolphins? Give them a gift for Christmas they will never forget – a dolphin cruise aboard Voyager Deep Sea Fishing and Dolphin Cruise. We make it easy to purchase your gift certificate online and avoid the Black Friday crowds. Purchase as many tickets as you need for both adult and children. Then book your dolphin cruise when it is convenient for everyone. My family and I went on Dolphin Cruise on the evening of July 20. We had a great cruise. Lots of scenery and manage to see several Dolphins. The crew was very helpful and interacted with passengers. We all had a great time. Well worth the money. Capt. Brian, Ken, and Brian was an awesome crew. Capt. Brian was very knowledgeable and informative on the trip about the history of the water ways. Brian and Ken were awesome interacting with everyone and showing them some of the fish they caught in the net before they released them. Definitely will go back. If the kids won’t sleep the night before Christmas, just think how sleepless they will be the night before a dolphin cruise! When you use your gift certificate to book a Myrtle Beach dolphin cruise, you will venture through the intercoastal waterway and out into the Atlantic Ocean. Look for the Shrimp Boat Fleets as they work their nets – you will find the dolphins looking for dinner. Other marine life like sharks feed behind the shrimp boats. As we sail the crew will bring up sea life for the kids and adults to examine. Expect to see crabs, shrimp, sea urchins, sand dollars and even baby sharks. Our Myrtle Beach dolphin cruises last for 2-1/2 hours of exciting fun for the whole family. All of our vessels are US Coast Guard licensed and certified. We have the latest electronics and safety equipment onboard. Our crew is knowledgeable and courteous and we have a full galley on board with ice cold beverages and snacks. Your family will be surprised when they get this unusable gift for Christmas. Add a charm or stuffed dolphin for the kids to the gift certificate and they will have something to look forward to all winter. Visit our website to order your gift certificate today. Book Your Myrtle Beach Dolphin Watch Trip Now! Myrtle Beach is one of the top beach destinations in the country and it never ceases to amaze its guests. For many years now, tourists have enjoyed their stay here and longed for various water activities such as riding the Jet Ski, deep sea fishing and a dolphin watch trip. These water activities are enough to keep you busy all throughout your stay here. 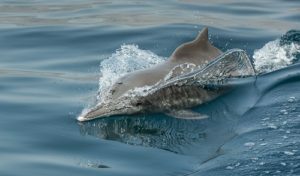 With lots of activities to indulge in, one spectacular method to delight in an afternoon in beautiful Myrtle Beach is to go on a Dolphin Watch Trip. The calm waters of Myrtle Beach are the home of a range of these stunning creatures and they are seen in abundance. A few of the dolphins you will stumble upon on your journey are the spinner dolphins and bottlenose dolphins. A few of them jumping in the air, a few of them swimming like the wind and some playing with each other. Aside from dolphins, you will also see sharks and other marine life. 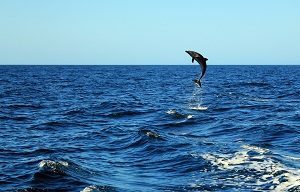 When you book a dolphin watch trip on Voyager Deep Sea Fishing & Dolphin Cruises, your journey will start when you cruise the Carolina Inland Waterways then head out the Atlantic Ocean. 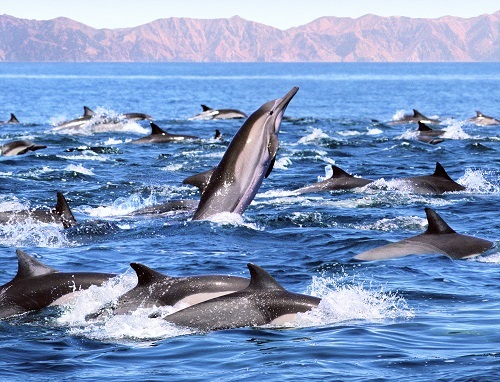 You will get to enjoy two and a half hours of dolphin watching which you and your family will surely love. You can be sure that the journey is safe because Voyager Deep Sea Fishing & Dolphin Cruises have watercraft that are USCG Licensed and Certified and equipped with the finest electronics and safety equipment. Dolphin Trips run daily from Monday to Saturday. You can also avail of their morning trips and sunset dolphins trips. Be sure to reserve a slot now and get to enjoy this wonderful water adventure with Voyager Deep Sea Fishing & Dolphin Cruises. The South Carolina coastline, especially in Myrtle Beach, belongs to a large and continuous beach stretch known as the Grand Strand. In 1936, Myrtle Beach, a man-made island was separated from the coastline by the Intracoastal Waterway. Nevertheless, the water is clear and wild animals abound. It offers the best experience for a sea adventure such as jet ski, private charter fishing, and dolphin trips. Dolphin watch tour Myrtle Beach is one of the most preferred tourist attractions among adventure cruisers. 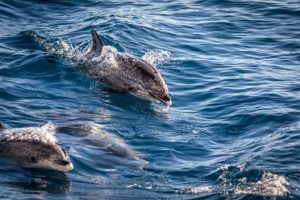 In some places, the autumn and winter season, while not as inviting to the tourist, provide plenty of possibilities to see dolphins due to their migration southward for the wintertime. In Myrtle Beach, you will be able to see dolphins any time of the year. Voyager Deep Sea Fishing & Dolphin Cruises in Myrtle Beach offers dolphin watch trips daily. In Myrtle Beach, you can also go on an adventure cruise ship to appreciate a day loaded with snorkeling or shelling. Watercraft cruise through the South Carolina Inland Waterways then to the Atlantic Ocean. In those areas, expect to see various sea creatures including flounder, black sea bass, sharks, and dolphins among others. Voyager Deep Sea Fishing & Dolphin Cruises offers more than just Dolphin watch tour, you can also avail of the private charter fishing and other boat trips. It is the ultimate offshore fishing experience. Generally, cruise ships in Myrtle Beach can accommodate anywhere from 30 to 50 individuals although you could rent a private charter watercraft among buddies for a number of hours. Rates vary according to numbers, if you are a grownup or kid, and they commonly provide you with a life vest, snorkel tools, and other devices. If you want to know what sea adventure suits you and your family best, you can check online for the rates and activities lined up for you. Make certain that whatever charter watercraft you ride on has all the needed security tools defined by the US Coast Guard. Ensure that the watercraft, as well as the captain, are both USCG Licensed and Certified. 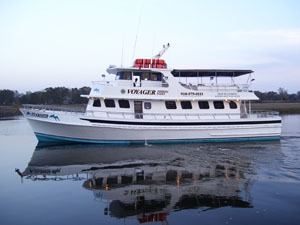 The Voyager Deep Sea Fishing & Dolphin Cruises treats aboard, drinks, restrooms, and also are handicap available yet it’s a good idea to call in advance to ensure if unique holiday accommodations could be made. Call now or book your next sea adventure online!